The opposition UPND has fired back at the move by the ruling PF to petition the Sesheke parliamentary by-election by announcing that they will petition three out of the seven local government by-elections won by the PF. UPND secretary general Stephen Katuka has told the press that his party will challenge the election of PF candidates in Mankomba (Lundazi), Anoya Zulu (Chililabombwe) and Chavuma ward bye elections due to the violence perpetrated by PF cadres during campaigns. And Katuka says his party is shocked that PF secretary general Davies Mwila is crying about violence in Sesheke when his party transported known Lusaka Intercity Bus Terminus thugs to cause chaos in Sesheke. “We wish to inform the nation that the United Party for National Development (UPND) shall petition election of Patriotic Front (PF) candidates in Lundazi, Chililabombwe and Chavuma ward bye elections owing to the violence instigated by the PF against our officials, members and electorates,” Katuka announced. On the violence in Sesheke, Katuka said: “There were atrocities and mayhem committed by PF thugs aided by state police in Sesheke that saw the UPND President Hakainde Hichilema and others faced assassination attempts on their lives due to live ammunition that was being fired at them. “As a matter of fact, Mr. Hichilema and his entourage were completely denied access into Sesheke for campaigns as they were being blocked despite an agreed campaign programme and venues they should have addressed rallies. “On the day Mr. Hichilema tried to address a meeting in the outskirts of Sesheke, some 40kms away from where the PF were having theirs, heavily armed gangs from Lusaka’s Intercity aided by state police disrupted the meeting by firing live bullets at unarmed civilians, with Mr. Hichilema finding solace in the bush going into hiding by walking more than 8 hours. And Katuka has pointed out that the PF transported thugs who are known acquaintances of president Lungu to Sesheke to cause violence. 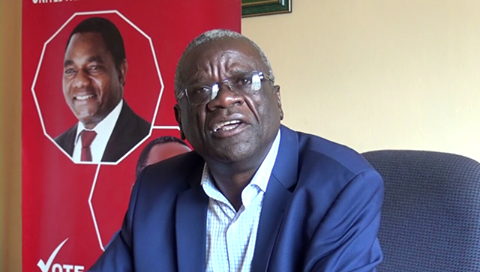 “We are hence taken aback that PF Secretary General Davies Mwila has also decided to cry about the violence in Sesheke, when his party transported known Lusaka’s Intercity Bus Terminus thugs. He says his party is glad that the PF through Mwila agrees with them that political violence is one of the crisis the country is facing and must be addressed by the Church led National Dialogue. “We urge the PF to be sober, civil and democratic in the manner they are running the affairs of the country which is currently hurting due to their irresponsible leadership.